"Users claim this is a top hiking backpack for females because of its thin profile, but it’s still large enough to hold all of the gear she needs." "Made with powder-coated stainless steel, these cups are durable enough to withstand all sorts of conditions." "Covers a range of active topics, including how to tackle that “time of the month” in the outdoors to pitching a tent or making a fire." "Packs easily, so it’s not an added burden on her adventure. Plus, it effortlessly unfolds and attaches to nearby trees or poles." "Help her track distance, steps and even take a call as needed. Since this accessory pairs with her smartphone, she’ll feel safe and connected." "An excellent option for both its supportive structure and breathable interior." "Comes in four fun colors that won’t wear and tear with use. Consider it a cute industrial strength mug." "The waterproof exterior was designed with zippered vents, an adjustable hood and a special closure to keep her feeling dry and content." "Provides up to six-and-a-half hours of heated relief before needing a recharge." "Made from 100% pure wool on one side and a nylon exterior on the other, it works as a great addition for picnics or days in the park." Wherever she travels, ensure she’s equipped with a pack to store all of her essentials. This option by Venture Pal features an ultra lightweight and portable design to make it the perfect accessory to take with her. Complete with several compact compartments and comfortable mesh straps, it works great for strenuous hikes or heavy loads alike. The pack itself weighs less than a pound, so it’s sure to ease the load she was planning on taking with her. Plus, with 10 stylish designs to choose from, she’ll look good the entire way there. 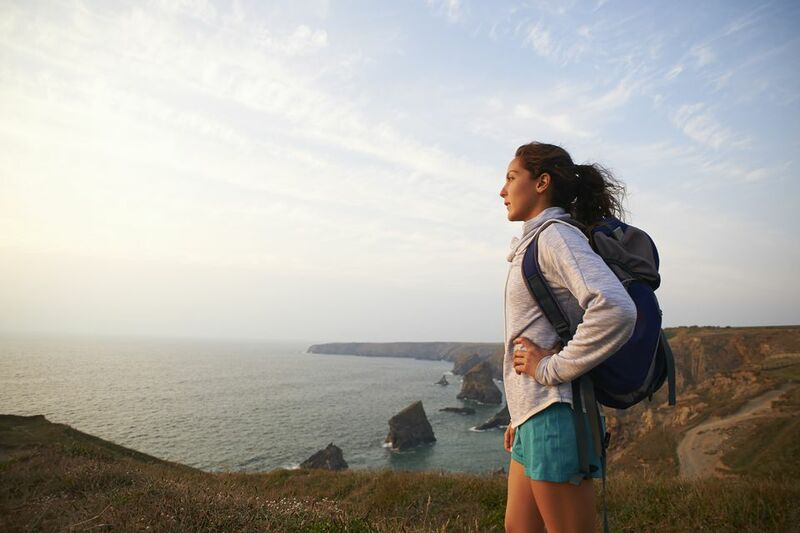 Users claim this is a top hiking backpack for females because of its thin profile, but it’s still large enough to hold all of the gear she needs. Just because she’s away from home, doesn’t mean she should go without her favorite glass of wine. The Summit Outdoor Wine Glasses make it easy for her to enjoy her favorite bottle, whether she’s at the top of a mountain, or in the middle of the woods. Made with powder-coated stainless steel, these cups are durable enough to withstand all sorts of conditions — while still keeping that wine tasting good in the process. The vacuum-insulated interior and BPA-free sealed lid help ensure a cool, refreshing sip every time. So next time a libation is in order, make sure she has this drinkware to reach for. Whether she’s an outdoor “pro,” or just looking to learn the basics, this guide is a great go-to. A Woman's Guide to the Wild handbook covers a range of active topics including, how to tackle that “time of the month” in the outdoors, to pitching a tent or making a fire. The best part? It’s all conveyed in an articulate and easy-to-follow way, with an underlying feminine perspective. Purchasers of the product say this is a must-read for any fearless female before her next adventure. Gift her some relaxation — even if she is mid-summit. The ENO Eagles Nest Outfitters DoubleNest Hammock is a noteworthy seating choice that others choose for all of their outdoor needs. And she should too. Here’s why: The lightweight hammock packs easily, so it’s not an added burden on her adventure. Plus, it effortlessly unfolds and attaches to nearby trees or poles. With the ability to hold up to 400 pounds, it’s durable enough to carry both her and a pal. Functionality considered, customers confirm this item has transformed their ability to enjoy the outdoors. Just take a look at the comments to understand why. Read more reviews of the best camping hammocks available to purchase online. Here’s a sleek gadget she’ll be glad to have on hand once she’s miles away from home. The Garmin Vívoactive White watch will help her track distance, steps and even take a call as needed. Since this accessory pairs with her smartphone, she’ll feel safe and connected even while she’s in the woods. Most notably, this watch has a long-lasting battery life which provides up to three weeks of power, so frequent charging between activities isn’t required. Of course, the high-resolution display and stylish white band certainly don’t hurt the overall attractiveness of this item that’ll quickly become her new hiking BFF. Good footwear is one of the most essential items for her adventure. After all, you don’t want uncomfortable shoes to be the source of an expedition cut short! For this reason, the Merrell Women's Moab 2 Vent Mid Hiking Boot is an excellent option for both its supportive structure and breathable interior. In fact, most reviewers say this style is more comfy than other selections they’ve gone with in the past. With two colors to choose from, and a whole range of sizes available, this product will be her perfect next pair. Note: Users recommend going half a size up for a more effective fit. YETI’s have been a household favorite for years. And their latest design, The Rambler, is a perfect next addition to her active arsenal. This handheld model is great for on-the-go use, while still delivering the same powerful insulating and durable properties the brand is so known for. Additionally, this model comes in four fun colors that won’t wear and tear with use. Consider it a cute industrial strength mug that looks like anything but that. This rain jacket/windbreaker combo has her back covered — literally. Made from the reputable brand North Face, it comes with all the amenities she needs to stay comfortable during her trek. For example, the waterproof exterior was designed with zippered vents, an adjustable hood and a special closure to keep her feeling dry and content even while it’s pouring rain. Purchasers of the product also mention its effectiveness in warmer weather, with the breathable fabric working to wick away body heat while still protecting it from incremental conditions. With several colors and sizes to choose from, the North Face Women's Venture Jacket is the perfect apparel item for her next outing. Let’s be honest — even colder temps won’t keep her indoors. In this case, ensure she’s sent off with the EnergyFlux Ellipse Rechargeable Hand Warmer so she stays warm while en route. This digital tool is designed to be held to keep her hands from getting cold. With a fully chargeable design, it provides up to six-and-a-half hours of heated relief before needing a recharge. Bonus: It also contains a USB power bank to keep phones, GPS’s and other items charged and ready while she warms. Consider it one handy gift she never knew to ask for but will use for all of the (cold) days to come! For the more casual outdoorsy gal, this Pendleton Roll Up Blanket is an ideal present. Made from 100% pure wool on one side, and a nylon exterior on the other, it works as a great addition for picnics or days in the park. Since it has a handle and a roll-up design, Pendleton makes it easy to tote along, too! Complete with a gorgeous — and durable — plaid style, this is one product that will become an instant family heirloom for all future adventurers to come.